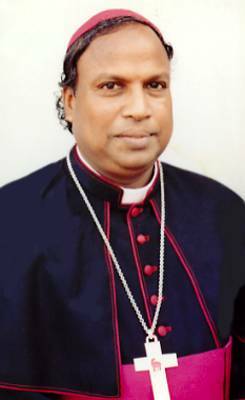 Archbishop of Hyderabad, Rev Marampudi Joji, passed away at the Bishop's House in Secunderabad on Friday afternoon due to cardiac arrest. After lunch at 2 P.M., the bishop went to his room to take rest and locked it from inside. As the bishop was not keeping well for the past few days, he used to take rest till 5 P.M.. But on Friday, as the bishop didn't come out even after 5.30 pm, his secretary K. Pratap knocked on his door. Finding no response from the bishop, his servants were alerted and they found him lying on the floor. Doctors of Care Hospital, Nampally, who were summoned declared the bishop dead around 6 P.M. The bishop had undergone a bypass surgery at Care Hospital in 2002. Marampudi Joji was born in Bheemavaram of West Godavari district on October 7, 1942. He became a priest in 1971 and was made bishop of Khammam in 1991. In 1996, he was appointed bishop of Vijayawada and was made Archbishop of Hyderabad on January 29, 2000. The archbishop's body was shifted to St Mary's Church, Secunderabad, at around 10 P.M. where thousands paid their last respects. As mentioned in his will, the bishop's funeral will be held on Sunday at Gunadala shrine, Vijayawada at 3 pm. Laity and public will be allowed to pay their last respects at the Gunadala shrine premises. As a mark of respect for the late bishop, all Catholic educational institutions in Medak, Ranga Reddy district and the twin cities of Hyderabad and Secunderabad will be remain closed on Saturday. Archbishop Joji, who was himself a "Dalit" (what used to be known as an "untouchable") - was a committed social worker and, as a Bishop of the Catholic Church, he fought for the emancipation and amelioration of Dalits. He worked as honest, efficient, righteous, diplomatic clergy, he served as the true disciple of Almighty God. He was very strict for the upliftment of Dalits, at the same time he loved all the people irrespective of Castes and creed. He was living as a leading revolutionary Bishop and the social worker by thinking the poorest and the downtrodden. The Chief Minister, Mr K. Rosaiah, on Saturday visited the St Mary’s Church in Secunderabad to pay his last respects to Archbishop Marampudi Joji. Mr Rosaiah laid a wreath on the body of the Archbishop and observed two minutes of silence. The Archbishop's funeral will be held at Vijayawada on August 30, at the Gunadala Shrine, according to his Will. Archbishop Joji, more popularly known as the "People’s Archbishop" had passed away in his sleep late on Friday evening. He was 68. Archbishop Joji was born at Bhimavaramon October 7, 1942 to Joseph and Mainkyamma. He was educated at the Nuzvidu Minor Seminary and gained his priesthood training in Hyderabad and Bengaluru. A deeply secular and pious man, the Archbishop was ordained a priest at Gunadala in 1971. The Archbishop was deeply interested in journalism and had obtained diplomas in catechism, journalism, advertising and PR from Loyola Institute of Communication and Arts. He also graduated in business administration and accountancy from Bombay University. Apart from church-related activities, the Archbishop was keenly involved in civic affairs. He was a member of planning commission and was co-opted member of the Vijayawada Municipal Corporation. He was appointed Bishop of Khammam in 1992 and then Bishop of Viajayawada in 1996. He was named the Archbishop of Hyderabad on March 17, 2000. In his last will, Archbishop Joji stated that he wished to be buried beside his guru, Bishop Thumma. Joji had written the last will and testament on October 7, 2000, a few months after he was appointed Archbishop of Hyderabad. “I brought nothing into this world and I go out of it taking nothing with me. All material goods, money, books, Episcopal insignia and everything else which had been at my disposal for use during my lifetime and which may stand in my name after death, I leave to the diocese and my successor. Neither relatives nor friends have any claims to any of these things,” Archbishop Joji’s will stated. Special prayers were conducted continuously from Friday night and hundreds of priests and nuns from all over the state came to St Mary’s Church to have a last glimpse of him. The Hyderabad Vicar General Fr. Y. Bala Shoury said the body would be taken in a procession at 9 am on Sunday from St Mary’s Church to St Mary’s School Ground. The holy mass will be celebrated at 10 A.M. The body will be taken to Vijayawada for burial.